Will Smartwatches be the Next Distraction for Drivers? Will Smartwatches Lead to More Distracted Drivers? If youre driving down the road and the watch on your wrist suddenly lights up and starts vibrating to notify you of a new text message, will you be able to ignore it? This is a concern that many officials are expressing with the immersion of smartwatches into millions of households this year. With cell phone use accounting for 27 percent of all car accidents, 62 percent of people admit to keeping their smartphones within close reach while driving. That number is bound to increase with the new device that is attached to your wrist 24/7. If you or a loved one is injured or killed as a result of someone using their cell phone while driving, contact the auto accident lawyers at Phillips Law Group today to determine if you have a claim. With years of experience representing car accident victims, we are here to help you. The president and CEO of the National Safety Council considers this new technology to be just as dangerous, if not more so, than cell phones while behind the wheel. Despite tougher enforcement of laws against cell phone use while driving, the number of car crashes has actually increased. 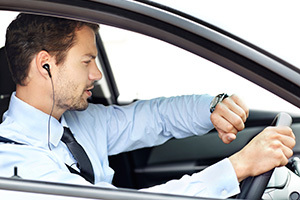 If law enforcement is already struggling to identify drivers who are visibly holding a cell phone in their hand while driving, how will they distinguish between drivers who are looking at their watch for the time versus those who are using a smartwatch? The smartwatch market is one of the fastest growing categories in the wearable industry and many of the major traditional watch brands are already onboard with the new technology, including Swatch, Tag Heuer and IWC. Estimates are forecasting an estimated 10 to 11 million devices will ship to the United States this year. Technology is continually making the roads we travel everyday even more dangerous. If you or someone you love is injured because of someone elses negligence, we can help. Our personal injury lawyers in Phoenix, AZ are ready to help get you the compensation you deserve. Call or text 1-800-706-3000 or complete the Free Case Review form today.